Our product range includes a wide range of dining table, eight seater dining table, ss dining table, stainless steel dining table, stainless steel dining tables and steel dining table. 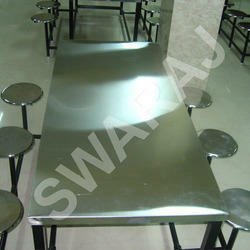 All Dining Table is manufactured from prime quality SS 304 Grade Stainless Steel. Tables are provided with SS Stools, these stools are made by SS Sheet on densified plywood base making it light weight & durables. 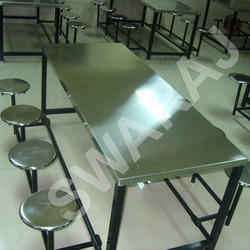 Our Tables are easy to clean with all full welded structure. All welded joints are smoothly finished and the frame is polished to 280 Grit Matt Finish. Our tables Tops are supported by Ecolene Sheets which complete protection from Borers, White Ants, Termites etc. Being a well-known firm, we are engaged in offering a large range of Eight Seater Dining Table to meet the needs of our customers. The Eight Seater Dining Table we offer is highly durable and ensures longer functional life. Furthermore, this dining table is spacious and adds elegance to the interior. We offer our range at most affordable rates. 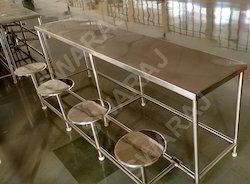 We are leading manufacturers of prime quality SS Dining Table required for Industrial Canteens, Schools, Colleges, Charitable Trust, Marriage Halls etc. 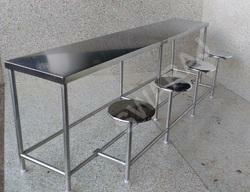 These tables are perfect combination of Engineering & Aesthetic coupled with High end quality features. Stainless Steel Dining Table offered comes in smooth and exciting construction finish and can be made available in different lengths, widths as well as height options to pick from. Further, these dining tables come fabricated in 304/316L grade stainless steel and can be provided with different surface finish options so as to provide for lasting service support. Stainless Steel Dining Tables offered comes in smooth and exciting construction finish and can be made available in different lengths, widths as well as height options to pick from. Further, these dining tables come fabricated in 304/316L grade stainless steel and can be provided with different surface finish options so as to provide for lasting service support. 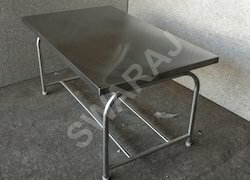 Banking on our immense market experience, we are offering supreme quality Steel Dining Table that is widely used in homes, hotels and various places. This table is designed by our trained designers by inculcating the latest techniques and superior grade stainless steel. 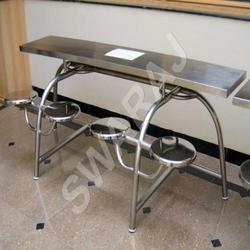 Looking for Dining Table Equipments ?